Not Your Ordinary Peanut Butter and Toast! Looking for a little snack idea? Getting a little bored with your breakfast toast? Peanut butter goes with so much more than just your basic jam 🙂 The standard peanut butter partners we normally think of include jam, honey and bananas. All of these are tasty treats but have you ever tried adding savoury stuff to the nuts? To start we have to talk about the basic peanut butter itself. The best thing you can do for your heart and your health is to go for the old-fashion plain roasted peanuts only butter. As we know all that sugar, extra (iffy) oils and preservatives aren’t that great for us … plus I promise you once you get used to the real thing … the junk filled stuff will taste like shortening with a hint of peanuts. You can also make your own fresh peanut butter at home with plain roasted peanuts and your food processor. Next you want to think along the lines of the bread your putting it on. Of course you want something hearty and whole grain. You can also try sprouted grain bread and sourdough. There are plenty of good breads to choose from. The final thing you need is your spices. If you still want something sweet try slices of apple on your peanut butter toast with cinnamon sprinkled on top. Thai spices work really well with peanut butter. Try mixing a little thai curry paste with your peanut butter and dribble a little fresh lime juice on top. Anything spicy works well with peanut butter! Another great way to mix things up is to use different nut butters. There are a whole host of varieties from cashew to almond to hazelnut. This is also a great way to spice things up when using the non-nut or fake peanut butters for school/camp lunches and children with allergies. 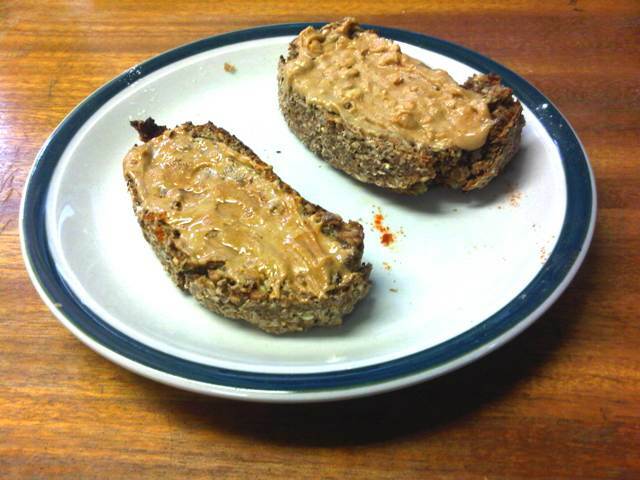 Toast your bread and spread on the nut butter. Sprinkle on your spices and mix in with your knife. Drizzle on the fresh squeezed juice and enjoy! What ideas do you have for mixing up your peanut butter and toast? Let us know in the comments section below!